If you are new here, or maybe haven’t been paying attention – I am a member of a local improv group. The catch 22 comedy crew. What is improv? It’s a type of comedy where there are no scripts, only guidelines and scenario, and the rest is made up on the spot. It’s a lot of fun, really, and it can be hilarious. For some reason, there is a misconception floating around that live video is improv – impromptu and made up on the spot – but that is very far from reality. When it comes to anything business related, improv is generally a bad idea. Now we could say that the opposite of improv, is having a script. Before you go live you should take the time to decide what you are going to talk about and write it out. It doesn’t need to be written out word for word (in fact I discourage that because it’s better if things are more loose and natural). Decide what you are going to talk about, a few key points, and then add a few bullet points for each point. This will not only let you walk through in your head what you want to talk about before clicking GO LIVE, but it can serve as a guide for you while you are sharing. PS: There is no shame in peeking at your notes while you are live, as long as you aren’t reading them word for word! A few months ago, I fell into a hole. This was a hole of watching Full House – the original – for hours at a time. And apart from how 90s everything was, do you know what I noticed? Every single episode followed the exact same formul. It starts with a sweet quick laugh, intro song (ahhh), set up, conflict, then resolution. Why do they do this? Because it’s a show structure that works, and its easy to repeat over and over again. You want to do that same with your live videos – pretend you are the producer of Full House and create a show structure that you can use over and over again. Are you going live just for the sake of it? Don’t. It’s not going to pay off and really, who has time for that. Tie your live videos into the bigger picture when it comes to your business. Does your industry have “seasons” or different topics of interest at different times – use that as a base. Are you planning some type of event – use that theme to create content leading up to it. Launching a program, course, or business, reverse engineer your content to align with your launch. Just “going live” isn’t going to get you anywhere, you need to do it strategically – add value and have a plan, and tie it into the other goals that you are trying to accomplish in your business. How to start growing with live video today, regardless of your tech-savvy-ness. By going live, you are opening yourself up to a little bit of risk. We might do something that isn’t “optimal” or that makes our videos less than they could be. And sometimes we make mistakes because we just don’t know or realize, and we learn from it. (I’ll be sharing some of those mistakes with those who signed up for this training. But what I’m going to share with you in this video is more like: HOW COULD YOU THINK THAT WAS OK?? In case you’ve never gone live… Once you are done being “live”, your video is saved as a video on demand that you viewers can watch as they please. When they watch the replay, they watch from 0 seconds. “Hello everyone! We’re going live a little bit early today. Let’s just wait for everyone to join in”. Next that person proceeded to sit back and eat a bowl of Kraft Dinner! Why would you eat Kraft Dinner on live video!? It’s really important that you 1. Realize that the replay viewers watch your video from the beginning, and 2. That the majority of your viewers are actually going to be replay viewers. When you are doing your live, keep that in mind. Don’t only cater to your live viewers, or you will alienate the rest! A really cool thing about Live video is you can go live from anywhere and give your viewers a little sneak peek into your life. Even on vacation or while travelling. But please, oh please, if you are a business coach, DO NOT GO LIVE IN A BIKINI. There is nothing wrong with wearing a bikini. On the beach. The general rule for dress (and makeup) in a live video is to ask yourself this: would I wear this to a client meeting? Would I wear a bikini to a client meeting? No. Never. Would I show up with my hair a mess and no makeup. Again, I wouldn’t. Going live while lying in bed or on a couch. Driving while on live video. The thing is, anyone who shares social media of live video advice is probably always telling you to be yourself, to be real, to be vulnerable. But let’s not cross that line of being your authentic self, into TMI. Has anyone ever told you that you HAVE to do live video? Unfortunately, I’ve been hearing snippets of conversations and comments in Facebook groups that entrepreneurs feel like they have to go live. And what happens and you feel pressured? Well, your videos aren’t going to be any good. Look, I love live video, and I really do believe that it can benefit the majority of entrepreneurs, especially service-based entrepreneurs. 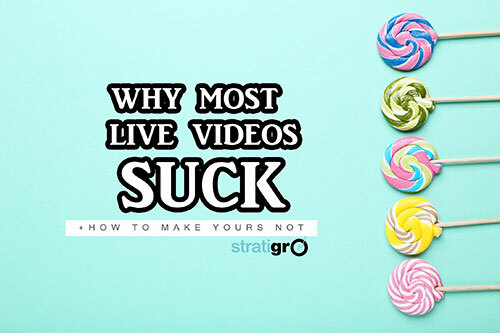 But, Live Video isn’t a magic pill. Hitting the live button isn’t going to magically make money rain down on you like a 70s game show money booth. You need to know why you are going live. I first started getting into this world of online marketing, I played around will all types of content. This included things like edited video. And if you’ve ever edited video, you know that it can be tedious. Not to mentioned that you end of taking 25 takes and then realize: oops I’ve done nothing all day except get way too much footage of this one thing. I get to interact with you fabulous people! Interaction and engagement with your audience is great for lots of reasons including, building relationships, taking future customers from cold leads to warm leads, learning from your audience (what they struggle with, want to know, and more). Live video has completely changed my business. Part of that is a natural outcome of the fact that when I started doing lives was around the time that I pivoted an went all in with social media. But it’s not only that. I do a live video every single week with few exceptions. This is partly habit at this point. But sometimes I wonder - why would I NOT go live. It’s the perfect opportunity to share value, increase my visibility and connect with my audience. Isn’t that what we all want? So, no. You don’t HAVE to go live. But why wouldn’t you? Today marks the launch of The Video Marketing Summit for Entrepreneurs – a 3-day online event made up of expert interviews with video marketing experts from around the world! This event is for any entrepreneur who wants to leverage the power of video to grow their business. Whether you are already creating videos, or even just thinking about it, there is some great value inside this event for you. The summit is free! All interviews are available to you for 72 hours from the time they are released. However, if you want lifetime access to the videos you can purchase VIP access (<hyperlink this https://www.paypal.com/webapps/shoppingcart?mfid=1550587272411_be384e3ce0686&flowlogging_id=be384e3ce0686#/checkout/shoppingCart) for $47 up until the end of Day 3! I was able to interview some amazing video marketers for this event. I am so grateful to them all for their participants and for sharing their expertise! Here’s a brief summary of the experts! And we wrap up with various other video marketing strategies! Mark Metry shares how to use video to promote your podcast and your business, and what the future of video looks like.